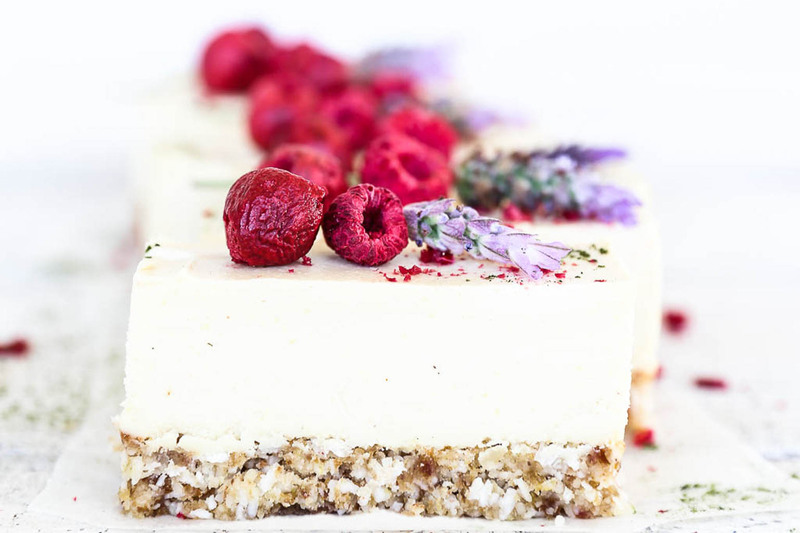 One of my passions is creating sweet treats that taste freaking amazing AND are truly good for you. And by good for you, I mean full of protein and nutrients, ideally organic, dairy and gluten free, activated if raw, and as little or no sugar as possible. Not always an easy task. More often than not treats which meet the “good for you” part fail miserably in taste department, and if they taste amazing it’s usually because they have some kind of sugar added. So these nutty chocolate truffles are my latest obsession. They’re full of nut protein, they have a good serving of healthy fats from nuts and coconut oil, they deliver a good does of antioxidants from raw cacao powder and best of all they’re only sweetened with a little rice syrup. Rice syrup is made from fermented brown rice and is completely fructose free. Fructose is the undesirable sugar that our bodies don’t have an off-switch for, meaning we don’t register when we’ve had enough. 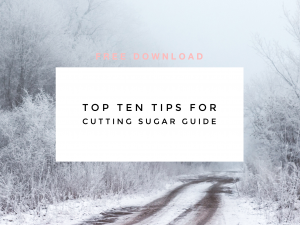 Our bodies don’t produce fructose and can’t metabolise it into energy (like they do glucose) so it’s sent to the liver which is the only organ that can metabolise it. If the liver is overloaded with fructose it’s then turned into fat and stored. Rice syrup is made up of glucose and maltose which our bodies can easily metabolise directly into useable energy. 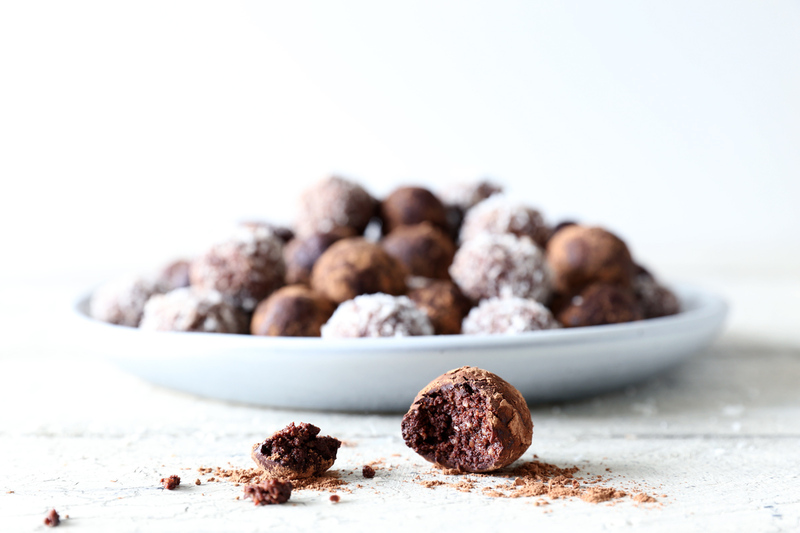 Rice syrup is quite a mild flavoured sweetener but works well with the rich chocolate flavour in these nutty chocolate truffles. I’ve given a few options for the nuts and nut or seed butter in the recipe below because if you stick to the basic quantities you can mix and match nuts and butters to your liking. Peanut butter for example, will give you the richest chocolate truffles, almond butter creates a toasty caramel flavour, and tahini a slightly savoury flavour. 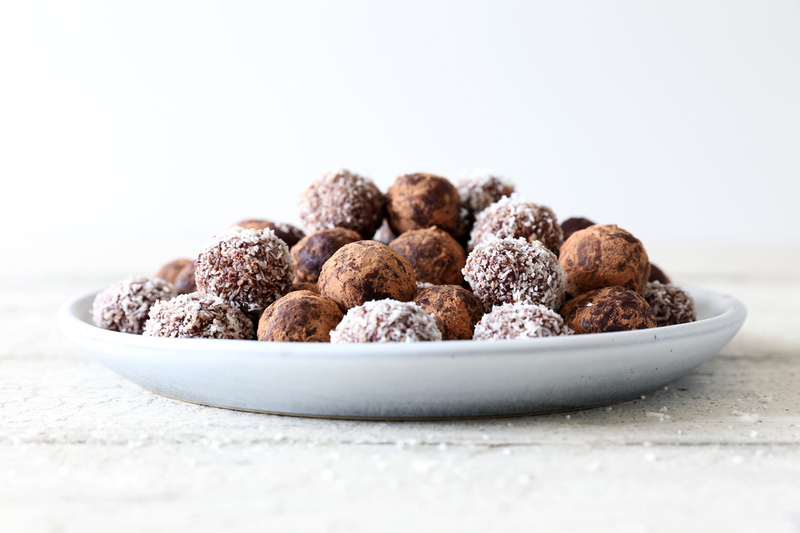 As always this recipe is super easy to whip up, simply throw all the ingredients into a food processor, blend, roll into balls and coat in your choice of topping. Desiccated coconut creates a sweeter truffle and raw cacao or matcha powder a decadent, slightly bitter truffle. You could also roll them in freeze dried fruit powders or finely chopped nuts, ferrero rocher styles. Get creative and let me know your favourite combinations in the comments below… Enjoy! Gently melt the coconut oil by placing into a heat proof bowl set over a pan of steaming water with the heat turned off. This ensures it isn’t heated above 46ºC and remains in it’s raw, nutritious state. 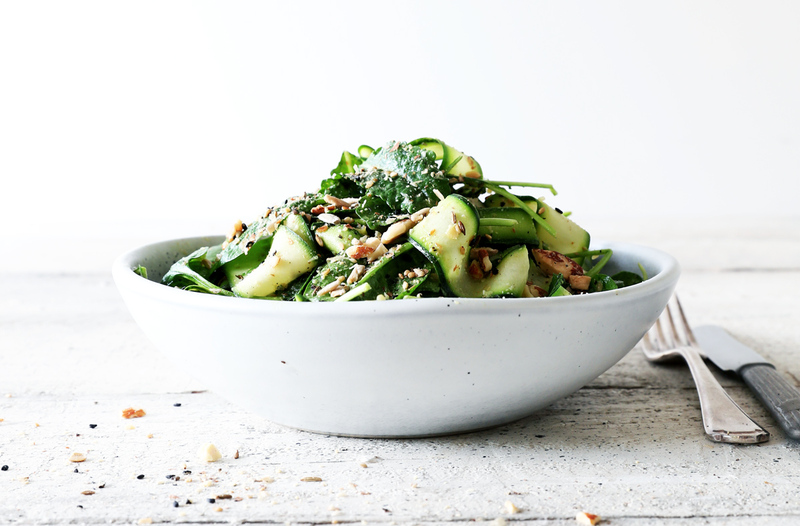 Place your combination of raw nuts into a food processor and blend until you have chunky crumbs. Add the rest of the ingredients, including the melted coconut oil, and blend until the mixture is well combined and comes together. Roll teaspoonful’s of the mixture into small balls. If your kitchen is quite warm place them into the fridge to chill for 10 minutes or so before rolling in the coatings. This sets the coconut oil and allows the coatings to stick better. 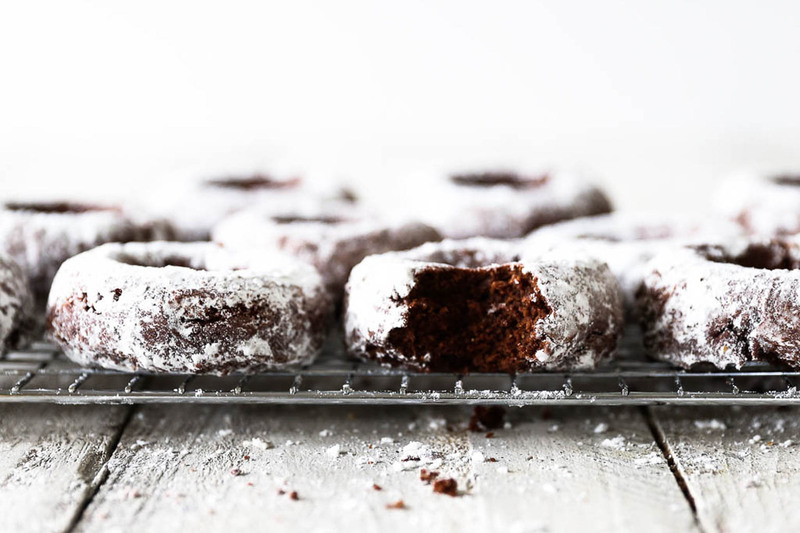 Place your coating of choice into a small bowl and roll the chocolate truffles until evenly covered. Store the nutty chocolate truffles in a sealed container in the fridge for up to 4 weeks, or in the freezer for up to 3 months. 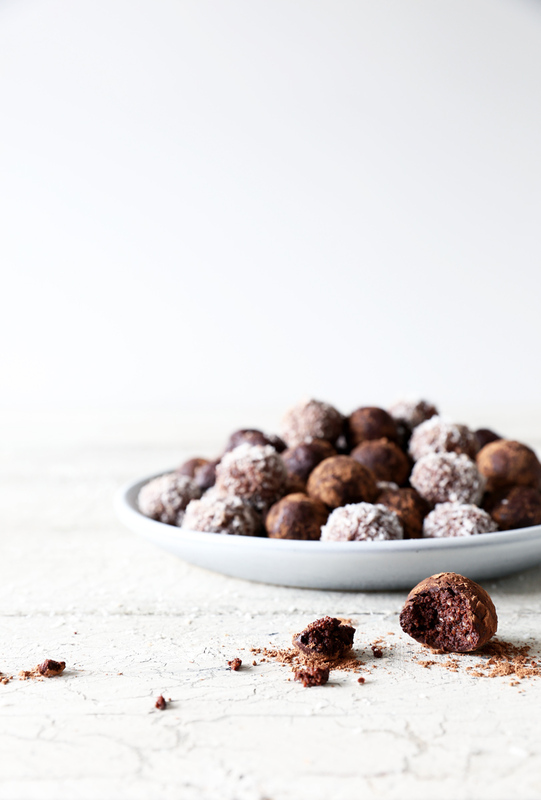 *to make these truffles even more nutritious, you can activate and dehydrate the nuts beforehand. This denatures the enzyme inhibitors in the nuts outer coating, which in turn makes the nutrients more bioavailable and easier to digest. To activate nuts soak them in filtered water using the guide times below, then either place them in a dehydrator set at 46ºC for 2 days or into an oven set on the lowest setting with the door slightly ajar. The nuts are ready when they’re completely dried through and crunchy.